There's lots of gift options for aspiring filmmakers and photographers on your holiday list. Here's a selection of imaging accessories for Phone users. After focusing attention on mobile photography in its global "Shot on iPhone 6" advertising campaign over the last year, Apple has assembled a new Photography Kit and Videography Kit for iPhone 6 and 6s users. A variety of third party developers are also offering accessories and apps for capturing and enhancing photos and film with iOS devices. The first package, aimed at capturing still images, combines an olloclip Active Lens bundle (ultra-wide and telephoto - $100 from Amazon.com and B&H Photo); a compact Manfrotto PIXI Tripod ($25 from Amazon.com and B&H Photo) and MeFOTO Sidekick 360 Plus Tripod Mounting Adapter (which locks an iPhone into position at virtually any angle - $35 from Amazon.com and B&H Photo) and a HISY Bluetooth Camera Remote (for shooting at a distance - $25 from Amazon.com or $20 from B&H Photo). 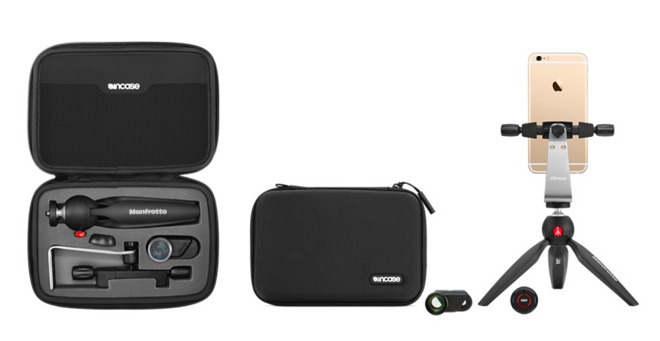 The photography accessories are all packaged in a compact, custom designed Incase Photography Kit carrying case. The package is designed to work with iPhone 6/6s and 6/6s Plus. A second package, targeting mobile filmmakers, bundles the olloclip Active Lens with a larger Manfrotto Compact Action Tripod and the MeFOTO Sidekick 360 Plus Tripod Mounting Adapter, as well as a Shure MV88 Digital Stereo Mic ($149 from Amazon.com and B&H Photo). 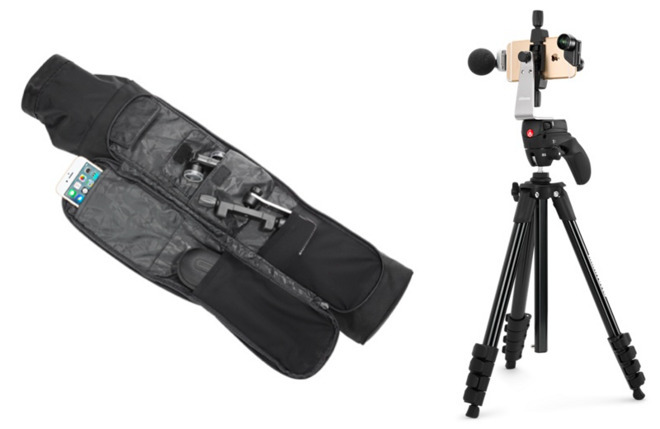 The videography accessories are supplied with a Incase Tripod Sling, a larger shoulder bag with additional pockets for other tools. This package is also designed to work with iPhone 6/6s and 6/6s Plus. Both of Apple's new accessory bundles are now available in its online store and at select Apple Retail locations, which are promoting them alongside other products in new retail feature bay collections. Apple is also featuring a variety of photography and creativity accessories in its online store. 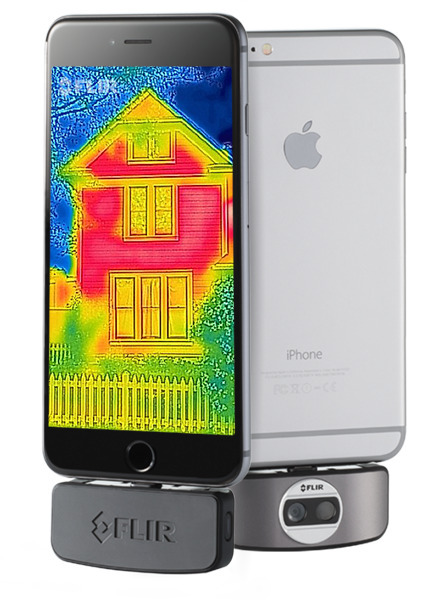 This camera accessory adds infrared photography to any iPhone 5/6 model, as well as recent iPads, enabling capture of heat images--and time-lapse sequences--revealing details otherwise invisible to the eye. It features a built in battery, and connects via Lightning. An alternative set of larger lens accessories is offered by Moment. 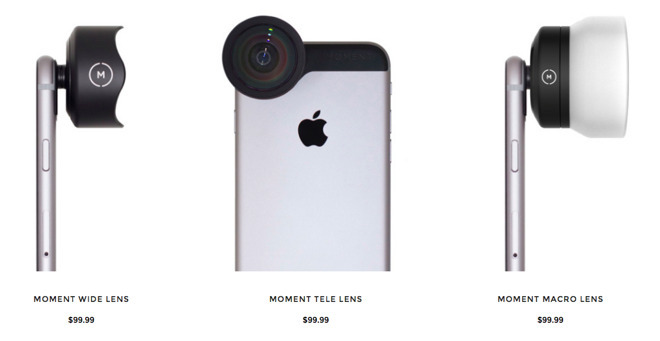 The company's Wide Lens (for capturing dramatic landscapes and tight interior shots with minimal distortion), 2x Tele Lens (for zooming in on action and travel shots) and 10x Macro Lens (for focusing on the details of small objects) are priced at $99 each, offering a high quality lens system for iPhone 6/6s users, as well as offering mounting plates for iPhone 5/5s/5c, iPhone 4/4s and iPad Air/Air 2 and iPad mini users. Filmmakers wanting to capture cinematic, wide format images can use Moondog Lab's high quality, affordable Anamorphic adapter to take full advantage of all the pixels captured by iPhone 6/6s while recording video in a 2.4:1 aspect ratio, with the kind of organic lens flares and distortion that typically requires very expensive equipment. Kickstarter Video from Moondog Labs on Vimeo. This lens, originally funded as a Kickstarter campaign, was used by director Sean Baker to shoot the full length feature film Tangerine entirely on an iPhone, garnering special attention at Sundance Film Festival and picked up for national theater distribution. It was also used by carmaker Bentley to shoot its Intelligent Details DxO One camera body (also available at $599 from Amazon.com and B&H Photo) adds a large 1 inch, 20.2 megapixel sensor camera to an iPhone 6/6s or 6/6s Plus, attaching to the phone via its Lightning connector. It uses the phone's Retina Display as a view finder, supplying a high end camera capable of taking pictures equivalent to a 32 mm lens. Introducing the DxO ONE Connected Camera from DxO on Vimeo. The DxO's f/1.8 aperture lens can capture professional grade images in very low light, and offers up to 1/8000 of a second shutter speeds to freeze action shots. The device itself is small enough to fit in your pocket, and connects to an iPhone using a swiveling hinge for flexible shooting using its own specialized app. 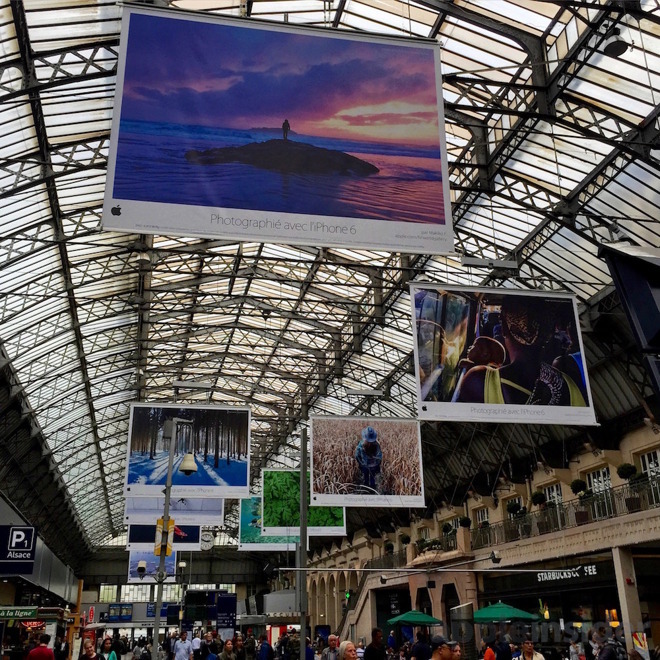 Photos are transferred to the iPhone via Lightning for immediate sharing.